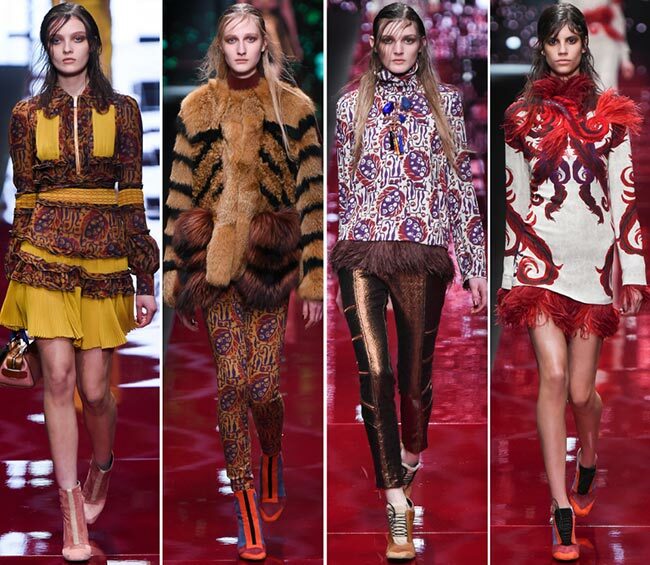 Minimalism and modesty have absolutely no power when it comes to the lush, opulent and extravagant Just Cavalli fashion staples. 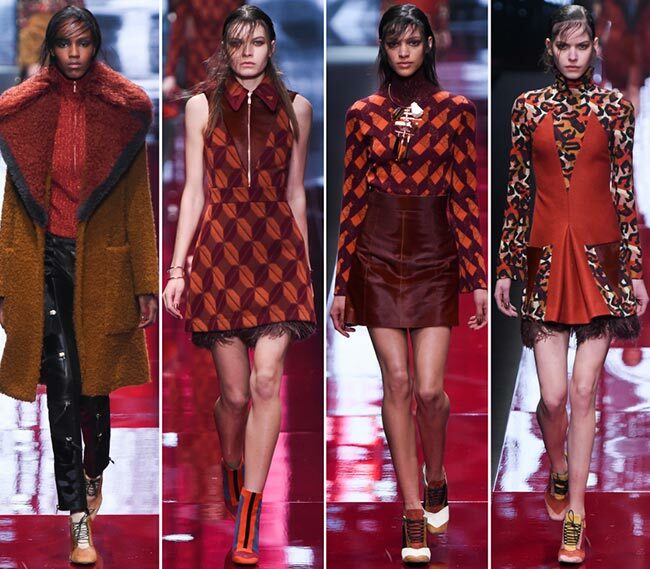 The spanking-new Just Cavalli fall/winter 2015-2016 collection just showcased at Milan Fashion Week fall 2015 brings a touch of boldness and luxury to fall fashion, showing a creative mishmash of prints, patterns, textures and shapes. 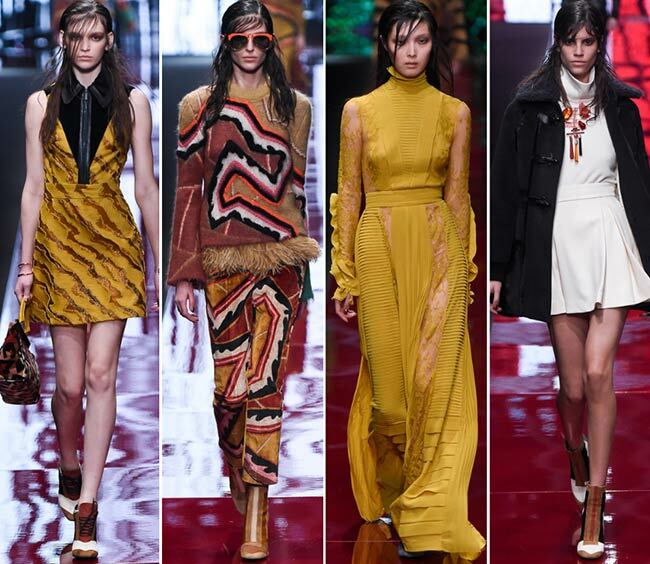 Creative designer Roberto Cavalli decided to embrace the Seventies in a new, more creative way, one that encourages wearing a deeper color palette and lavish volumes while keeping the structures in the iconic retro mood. 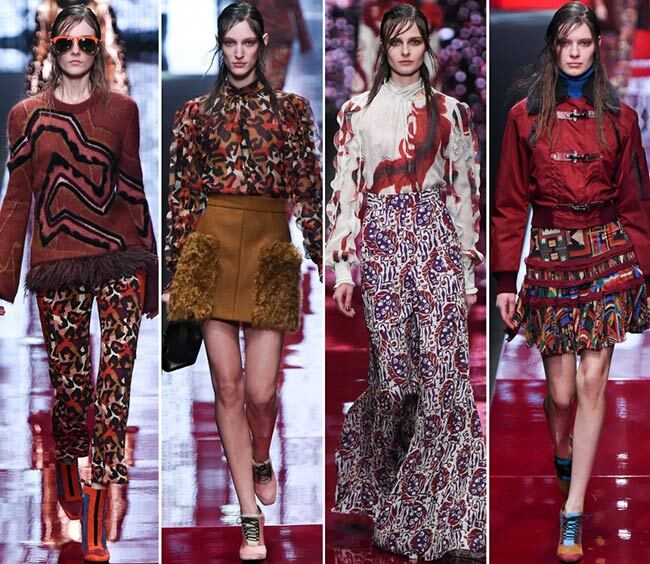 Ditching his signature wild animal prints and patterns, he decided to experiment with artistic Bauhaus inspired prints, opulent colors and texture combinations, as a result delivering an array of statement-making pieces, which never fail to celebrate warmth and comfort. 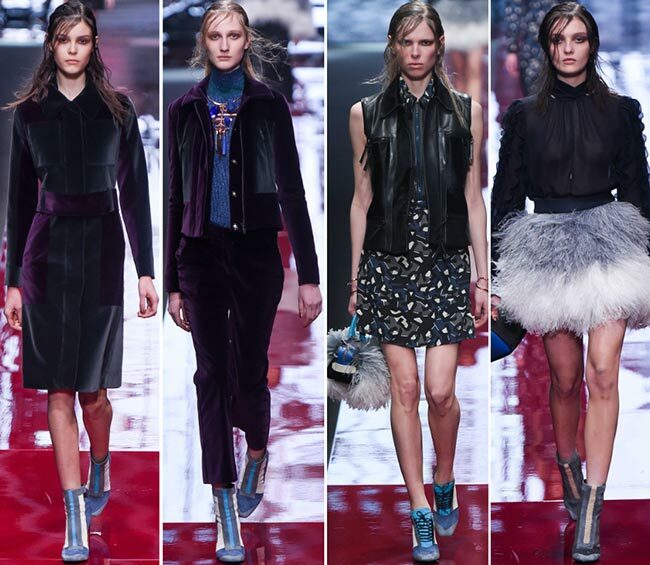 The overall color palette of the Just Cavalli fall/winter 2015-2016 collection is quite gloomy, perfect for the cold months. Think lots of blacks and grays spiced up with creamy whites, rich burgundies, splashes of mustard yellow and burnt orange, browns and an explosion of deep reds. Add Seventies paisley patterns and Asian feather swirl and fractal shard shape motifs to this and get ready to make heads turn as you pass by in these tantalizing pieces. 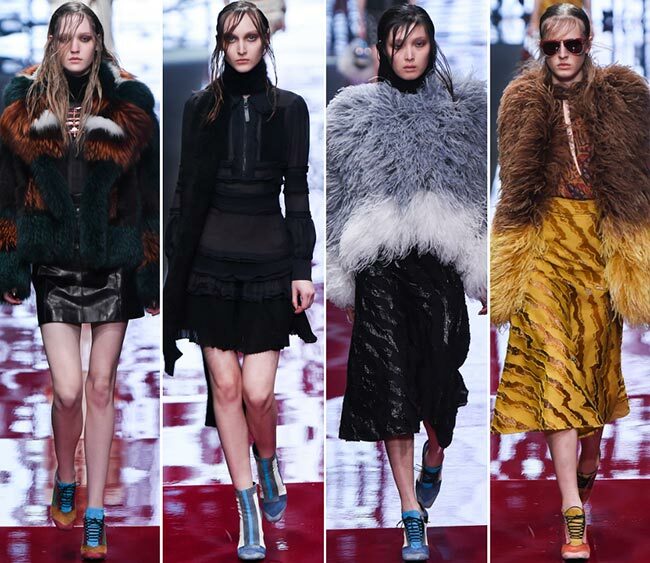 The interesting fabric combinations and creative mishmash of volumes and textures enhance the drama in the looks, and the same can be said about the deep smokey eye makeup in brown shades and the side-swept greased hair of the models. Coming to the lengths and styles of the clothing available, we can choose diversity as the best word to describe the entire lineup. We have there pretty mini dresses, below-the-knee ladylike designs, tea-length and breathtaking maxi options adorned with dazzling prints and patterns. We also have shiny skinny pants and perfectly tailored wide-leg culottes, and, of course, we have powerful outerwear designs ready to add warmth to the looks, while also taking the entire styling to a whole new level. In terms of the coolest fabrics utilized, we should mention the rich velvets coming in deep purple shades, the see-through black fabric used for the elegant airy shirts, the leather and suede combinations, as well as the big proportions of luxurious fur coming in all its forms and styles, but also the flirty ostrich motifs, looking especially cool for the mini skirt fusing light gray notes with white. In certain looks feathers had been used as beautiful trimmings on the hems, such as in case of the long-sleeved mini dress in white with the feathers and the patterns coming in rich reds. 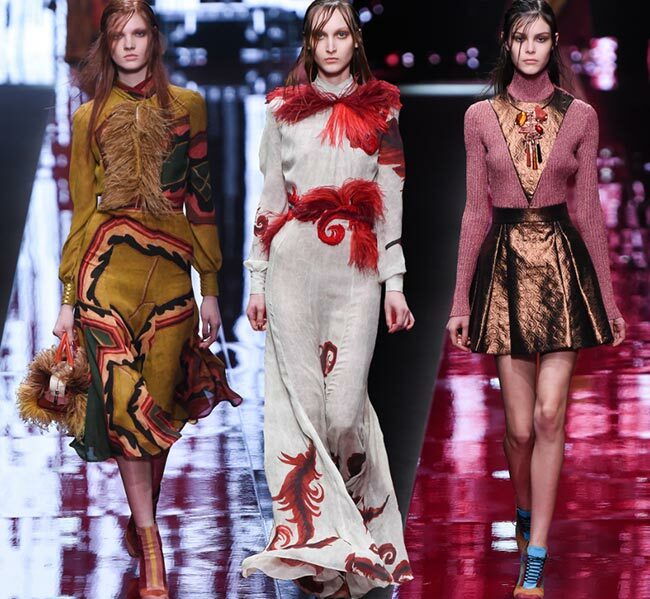 At the end of the show, we were also treated to breathtaking evening dresses, like the rich mustard piece or the closing look with red feathery details. Equally powerful was the game of accessories, as we fell head over heels in love with the architectural designs of the color-blocked lace-up shoes and the little feathery bags. 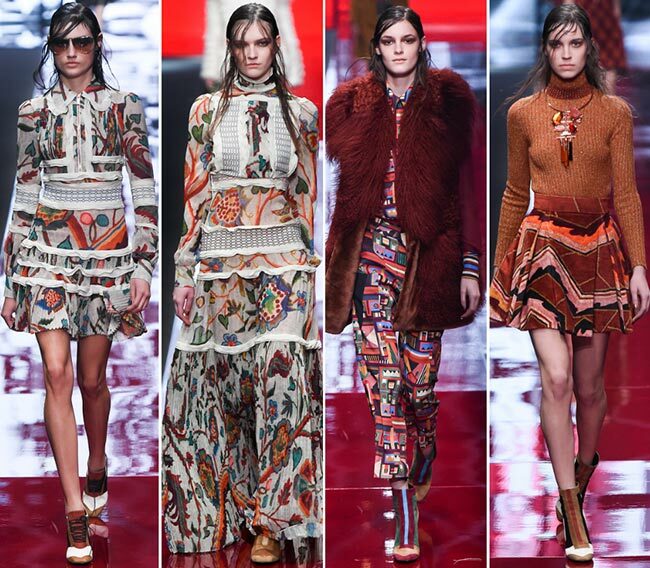 “An imaginary place where the warmth of romance and the formality of techno merge,” Roberto Cavalli stated describing his gorgeous disco-ready style for fall. True to form, his designs are made to dazzle!